Famitsu,[a] formerly Famicom Tsūshin, is a line of Japanese video game magazines published by Enterbrain, Inc. and Tokuma. Famitsu is published in both weekly and monthly formats as well as in the form of special topical issues devoted to only one console, video game company, or other theme. Shūkan Famitsū,[b] the original Famitsū publication, is considered the most widely read and respected video game news magazine in Japan. From October 28, 2011 Enterbrain began releasing the digital version of the magazine exclusively on BookWalker weekly. Cover art for the first issue of Famitsū magazine (then known as Famicom Tsūshin), June 1986. The Atari 2600 controller and the Family Computer controller can be seen on the cover. The magazine was published by ASCII from its founding through March 2000 when it was sold to Enterbrain, Inc. The name Famitsū is a portmanteau abbreviation of Famicom Tsūshin;[h] the word "Famicom" itself comes from a portmanteau abbreviation of "Family Computer" (the Japanese name for the Nintendo Entertainment System)—the dominant video game console in Japan during the 1980s. The first issue was published on June 6, 1986. Today, Shūkan Famitsū features multi-platform coverage. Shūkan Famitsū is a weekly publication concentrating on video game news and reviews, and is published every Thursday with a circulation of 500,000 per issue. Gekkan Famitsū is published monthly. Famitsū magazine covers alternately feature pop idols or actresses on even-numbered issues and the Famitsū mascot, Necky[i] the Fox in odd-numbered issues. Year-end and special editions all feature Necky dressed as popular contemporary video game characters. Necky is the cartoon creation of artist Susumu Matsushita, and he takes the form of a costumed fox. The costumes worn by Necky reflect current popular video games. Necky's name was chosen according to a reader poll, and it derives from a complex Japanese pun: "Necky" is actually the reverse of the Japanese word for fox, キツネ,[j] and his original connection to Famicom Tsūshin is intended to evoke the bark of the fox, the Japanese onomatopoeia of which is コンコン[k]. Necky makes a cameo appearance in Super Mario Maker. Entamikusu[l] (previously Otonafami[m]) is written for an older audience and covers retrogaming. It has been published monthly since November 2010. Famitsū Connect! On[n] reports on online gaming. Famitsū DS+Wii[o] reports on Nintendo platforms (currently the Nintendo 3DS and Nintendo Switch). The magazine was formerly known as Famitsū 64 and then Famitsū Cube (among other variations of those two names) based on whatever platforms Nintendo was producing games for at the time. Famitsū GREE[p] reports on mobile gaming via GREE. Famitsū Mobage[q] reports on mobile gaming via Mobage. Famitsū Bros.[r] (previously Famicom Tsūshin Kōryaku Special) was written for younger audiences and concentrated on video game hints and strategy. It was published monthly and went defunct in September 2002. Famicomi[s] (previously Famitsū Comic) was a comic and manga magazine published irregularly between 1992 and 1995. Famitsū DC[t] reported on Sega platforms news and covered the Dreamcast. Previous incarnations of this magazine included Sega Saturn Tsūshin which covered the Sega Saturn, with earlier issues covering earlier Sega platforms. Famitsū Sister[u] covered bishōjo games. Satellaview Tsūshin[v] covered the Satellaview. It was published monthly and ran for only 12 issues from May 1995 to May 1996. 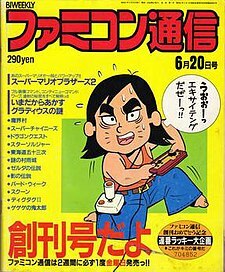 Its inaugural issue was the May 1995 issue of Gekkan Famicom Tsūshin. Virtual Boy Tsūshin[w] covered the Virtual Boy. Only one issue was ever published in 1995. Famitsū PS[x] (previously PlayStation Tsūshin) began publication in May 1996, and reported on Sony platforms news. It was later known as Famitsū PS2 and Famitsū PSP+PS3 before being discontinued in March 2010. Famitsū Wave DVD[y] (previously GameWave DVD) covered events, film, and previews. Each magazine included a DVD disc (NTSC Region 2) with video game footage. It was published monthly and went defunct in May 2011. Famitsū Xbox 360[z] reported on Xbox and Xbox 360 news. It went defunct in 2013. Video games are graded in Famitsū via a "Cross Review" in which a panel of four video game reviewers each give a score from 0 to 10 (with ten indicating the best game). The scores of the four reviewers are then added up for a maximum possible score of 40. From the twenty-four games awarded with a perfect score as of 2017[update], three are for the Nintendo DS and five are for the Wii. The PlayStation 3 also has five games with a perfect score and the Xbox 360 has four, with both consoles having four titles in common. The others are for different platforms with only one title each. Franchises with multiple perfect score winners include The Legend of Zelda with four titles, Metal Gear with three titles, and Final Fantasy with two titles. The most recent game to receive a perfect score is Dragon Quest XI. Famitsu administers the Famitsu awards. Video games receive a number of different awards in categories like Innovation, Biggest Hit, Rookie Award, Highest Quality, etc. One or two "Game of the Year" awards are granted as the top prize. Top prize winners are determined by a combination of critical and fan review scores as well as sales figures. UK trade magazine MCV and Famitsu have an exclusive partnership which sees news and content from each magazine appear in the other. ^ Japanese: ファミ通, Hepburn: Famitsū? ^ Japanese: 週刊ファミ通?, lit. "Weekly Famitsū"
^ Japanese: ファミコン通信?, lit. "Famicom News"
^ Japanese: 週刊ファミコン通信?, lit. "Weekly Famicom News"
^ Japanese: 月刊ファミコン通信?, lit. "Monthly Famicom News"
^ Japanese: ネッキー, Hepburn: Nekkī? ^ a b "Enterbrain Brand Information" (in Japanese). Enterbrain. Retrieved 2015-05-01. ^ Tor Thorsen (2006-03-08). "FFXII gets perfect score from Famitsu". GameSpot. Retrieved 2006-06-09. ^ Steve Kalpaxidis (2005-07-01). "PS3 To Come Without Bundled HDD?". Advanced Media Network. Retrieved 2006-06-09. ^ Rodney Quinn (2006-03-09). "Final Fantasy XII scores perfect 40/40 in Famitsu reviews". Ars Technica. Retrieved 2006-06-09. ^ "週刊ファミ通（電子版）が10月28日から販売スタート！ - ファミ通App". www.famitsu.com. Retrieved 2015-12-10. ^ Martin Picard (December 2013). "The Foundation of Geemu: A Brief History of Early Japanese video games". International Journal of Computer Game Research. 13 (2). Retrieved 19 November 2016. ^ Ashcraft, Brian. Gaming Magazine Totally Snubs Xbox 360!? Archived 2009-05-05 at the Wayback Machine. Kotaku. 4 February 2008. ^ Gifford, Kevin. 'Game Mag Weaseling': Japan Mag Roundup 2008. GameSetWatch. 27 April 2008. ^ 'Necky the Fox' 今も尚輝き続ける松下進の代表的キャラクター. SusumuMatsushita.net. 10 July 2004. ^ Gifford, Kevin. Weekend Factyard: Famitsu/Famicom Tsushin MagWeasel. 19 September 2009. ^ Calvert, Darren. "Super Mario Maker DLC Confirmed, Famitsu's Mascot Necky The Fox Coming Soon". Nintendo Life. Gamer Network. Retrieved 9 September 2016. ^ "MCV launches daily service". Intent Media. 2007-02-26. Retrieved 2007-03-14.